This the last post from a recent visit to Mashatu in mid-July. The sunrises in mid-winter in Mashatu are crisp and colourful. 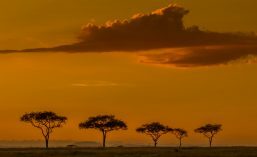 The sky was infused with dusty pinks and oranges and the blonde grass looked luminescient at dawn. The birds were heralding the new day but for the rest, the the bush is still. As the sun begins to seep into the gullies and valleys the light seems to bring the bush to life. A small family herd of zebra cantered away from us into the mopani scrub. Most of these mopanis do not get a chance to develop into trees as the elephant trim them. Later in the day, we found this mixed herd of zebras in the foreground and kudu in the background. Unlike predators, herbivores are much more tolerant of each other. Probably because they do not compete for food sources. The zebra graze select parts of the grasses while the kudu browse on bushes and trees. The mornings in Mashatu provide some interesting lighting. 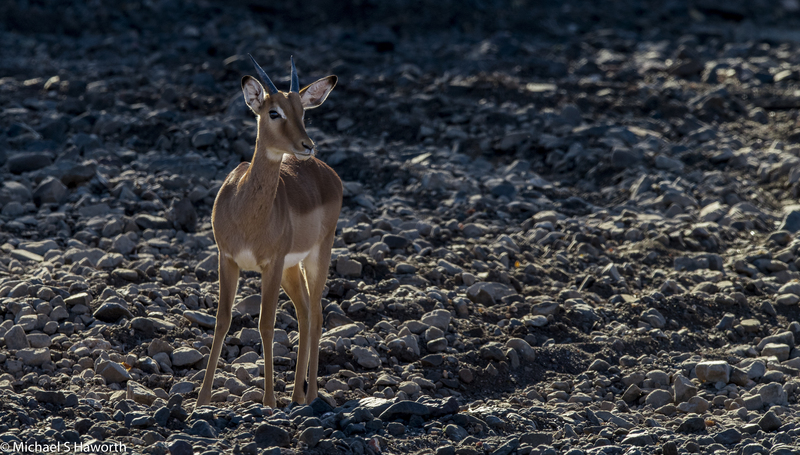 This young Impala ram in the Majale river bed was walking across a particularly rocky bed and surprisingly his underside was being lit by the glare from the rocks.. This next image is not a good photograph, but is interesting. I never knew that an Impala ram actually climbed on top of the female to mate. This male actually launched himself off the ground and grabbed on to the female with his forelegs ticked behind her hind legs. I never knew they did that as most antelope mate with the male’s hind legs firmly planted on the ground while mounting the female. Needless to say a young ram was taking lessons..
We did not see any wild pig this trip though they thrive in Mashatu but are nocturnal and very ellusive. 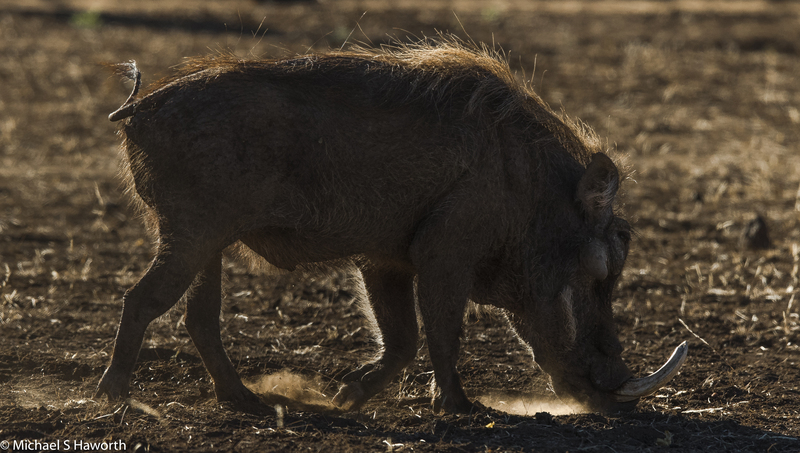 The warthog, or “howarts” as we nicknamed them, are ubiquitious and are not shy. 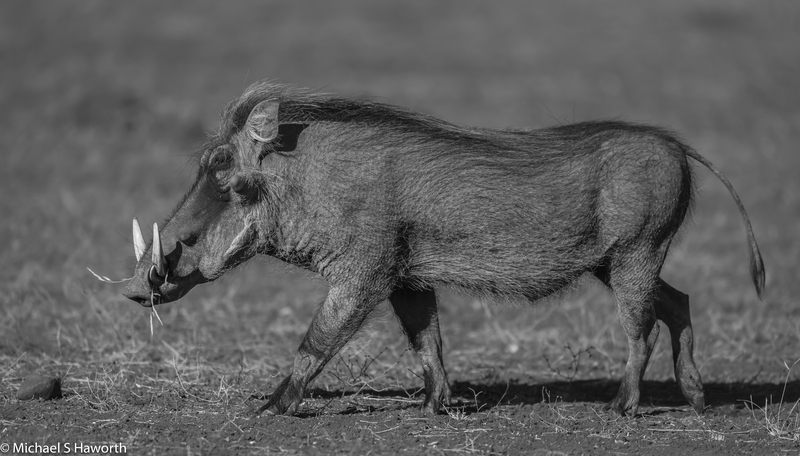 A black and white of image of one of the large warthog males we saw. Those tusks are formidable weapons which have damaged many a lion. 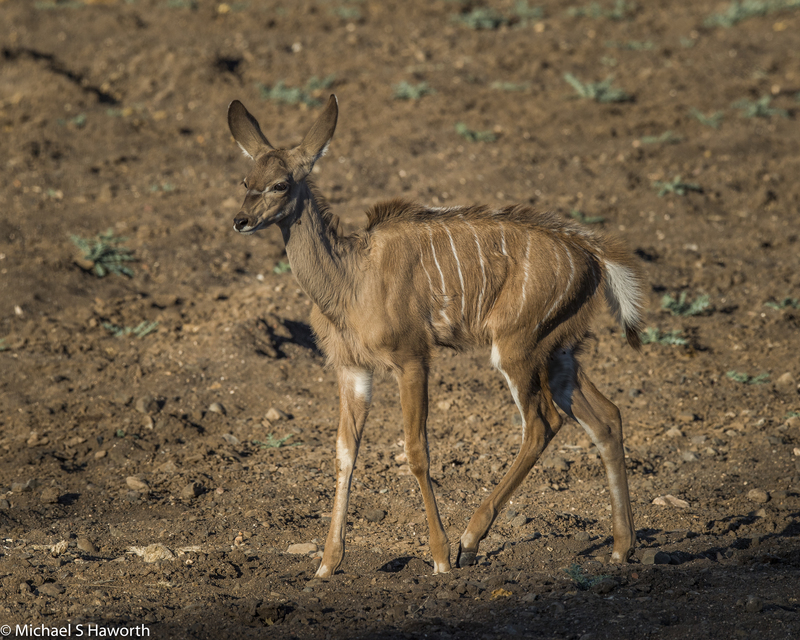 Kudu are plentiful in Mashatu and seem to cope better than the grazers in the dry winters as they are browsers. The youngsters are danity and delicate with distinctive white stripes on their torsos. We found three Kudu bulls wandering through the bush and occasionally stopping to browse. The one in the foreground must have been bitten by something and was desperately trying to reach back to lick the sensitive area. It is surprising how flexible these big bulls are! We came across many Steenbok in Mashatu. They are small brown antelope just a bit bigger than a duiker. 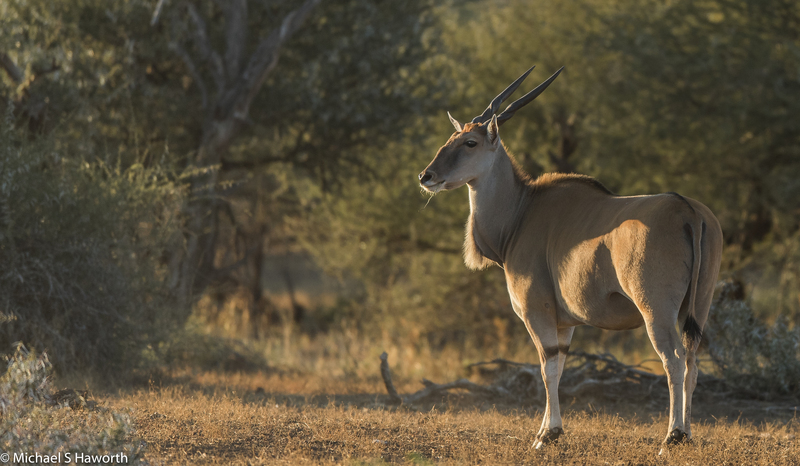 If their food sources are abundant, Steenbok may pair up for life, but in most cases these antelope are solitary creatures only coming together when they need to mate. This male was “checking out” a female to see if she was in estrous. Usually it triggers a flemen response where the male passes the scent across his Jacobson organ. This behaviour transfers pheromones and other scents into the vomeronasal organ located in the roof of the mouth. The pheromones in her urine provide chemical clues to the male about the state of the female. Steenbok are also the only antelope to have toilet etiquette – they dig a hole in which they will urinate or defecate. This is probably because their territories are so small and to disguise their presence from predators. Only the male Steenbok has the short, straight up horns. These small antelope are a beautiful golden brown colour, and have very distinctive, overly-large ears which look out of proportion to their heads. 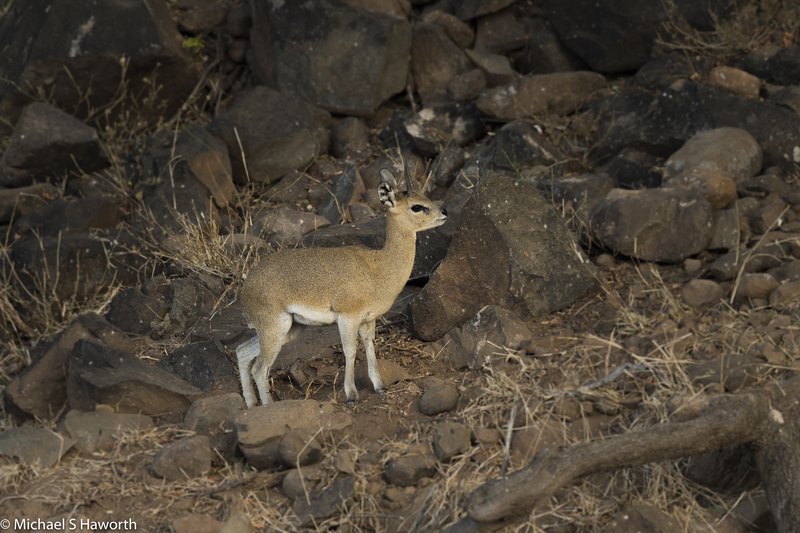 These are wary and somewhat shy small antelope but will eat anything from leaves and grasses to berries and seeds. 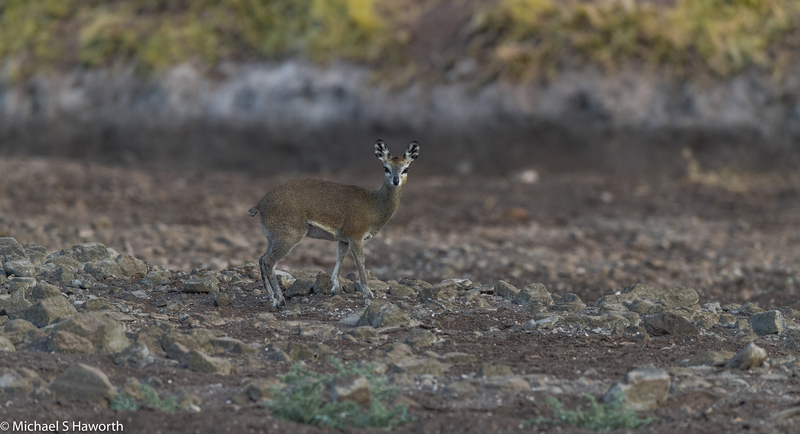 The Steenbok, similar to duiker and oribi, have conspicuous black, facial glands which are situated in front of the large, dark brown eyes. Pheromone-containing secretions from the preorbital gland may serve to establish an animal’s dominance when marking his territory. Males will mark off their territories with urine and secretions from the pre-orbital gland. This is a view from one of our morning coffee lookouts. The green trees demarcate the river course. A female Eland has spotted something. She has stopped in “mid-munch”. Although these are big formidable antelope, they make a bountiful meal for any lion which can bring one down. The female’s horns are wider set and thinner than the males’. Their senses are excellent and despite their size they are capable of jumping a considerable height. I have seen a large female easily jump over a six foot high mopani bush in her way. Most Eland are very skittish and as soon as you get too close they are off. This was the last of four females down in the river bed. The other three had already made a “b-line” for the trees and bushes at the top of the bank. Under one of the Mashatu trees, the foraging baboons must have dropped plenty of fruit which the kudu and impala were thoroughly enjoying. This is just another example of the interconnectness of life in the bush. We found a family of three Klipspringers, two parents and one sub-adult, walking across the dry riverbed. Being winter, they probably crossed the riverbed to look for food on the other side of the Majale river. I am always intrigued by Klipspringers as they look to be walking on tiptoes. They look like antelope, are called ‘rock jumpers’ in Afrikaans and are able to move around rocky outcrops like a mountain goat. Klipspringers form life-long pairs, each marking out a small territory. When one browses, its mate acts as sentry. If one partner spots danger it gives a piercing whistle to which the other mate quickly replies. 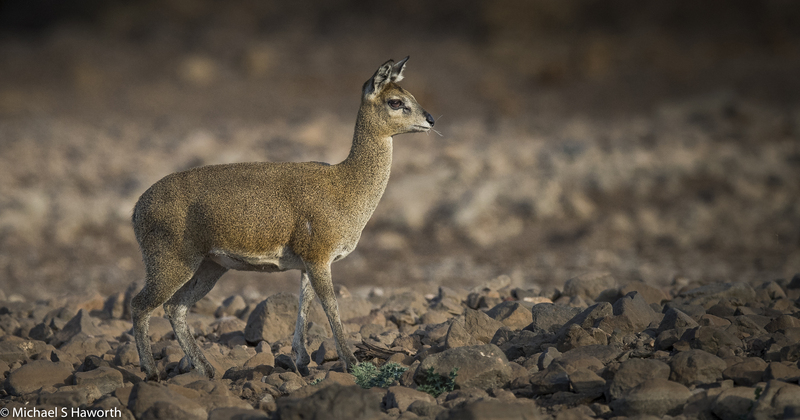 The Klipspringer’s main predators are leopards, caracals and Black Eagles all of which are ambush hunters capable of working on rocky outcrops. In southern Africa, only male Klipspringers have horns. Klipspringers have remarkable dense, coarse coats consisting of hollow hairs which rustle when shaken or touched. This helps insulate them on cold wintery rocky outcrops and cushions their bodies from any abrasion from sharp rocks. The coat varies in colour from yellow-brown to grey-yellow, with whitish underparts, chin and lips. Klipspringers have specially adapted hoofs for living in their rocky territories. They stand, walk, leap, and land on their tiny hoof tips and look to be constantly on tip toe. Their hooves have the consistency of hard rubber, absorbing the shock of their huge leaps. 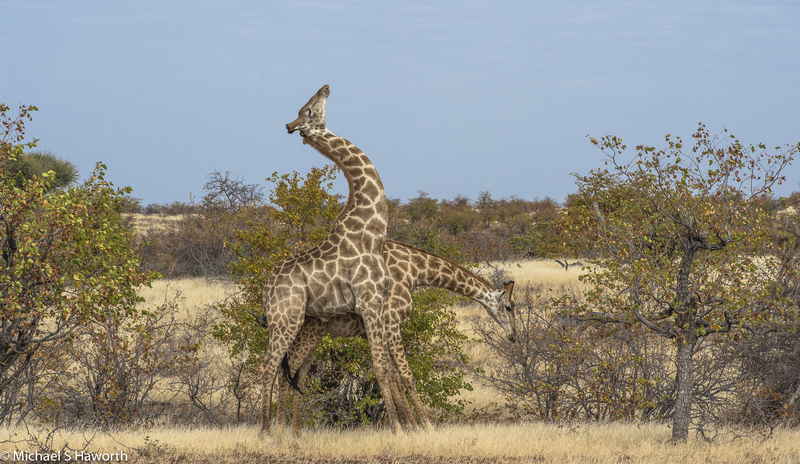 Two young bull giraffes testing each other’s strength. The incongruence of their size is countered by the coiling curves of their necks and vitality of their competitiveness. 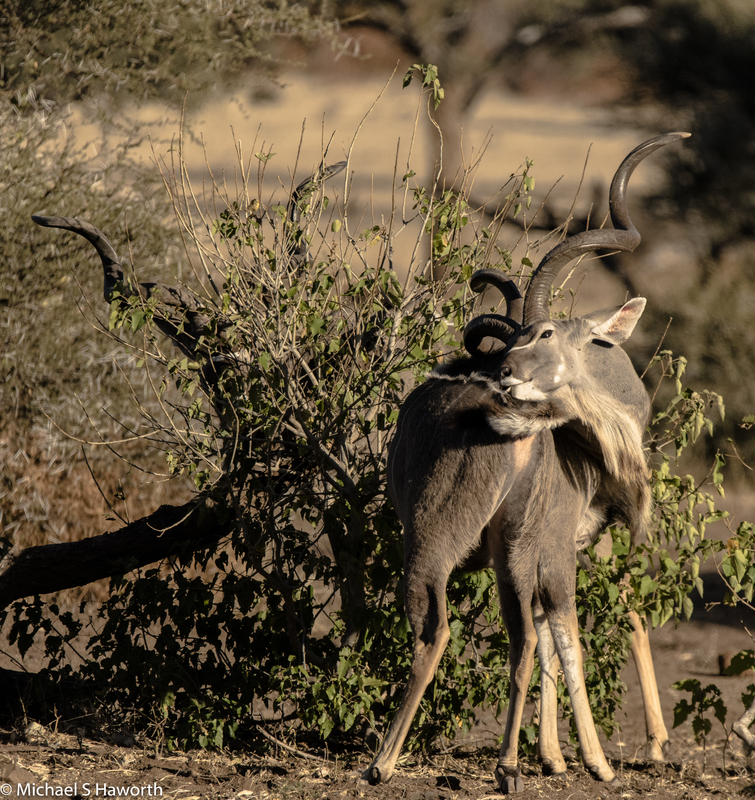 Often the play fighting starts off reasonably tame but at times it can get quite rough where you can hear the thud as one hits the flank of another with its ossicones. Onlookers get the sense that these head bashes are very sore “lamies”. A giaffe’s head swung from quite a height can act as a serious battering ram. I never grow tired of my trips to Mashatu. Each trip is different and each day is fascinating, bringing unexpected sightings and insights and the bush soothes my soul. You have provided us with interesting insights to the animals you observed as well as wonderful pictures. Your Mashatu series make a collectively interesting read.